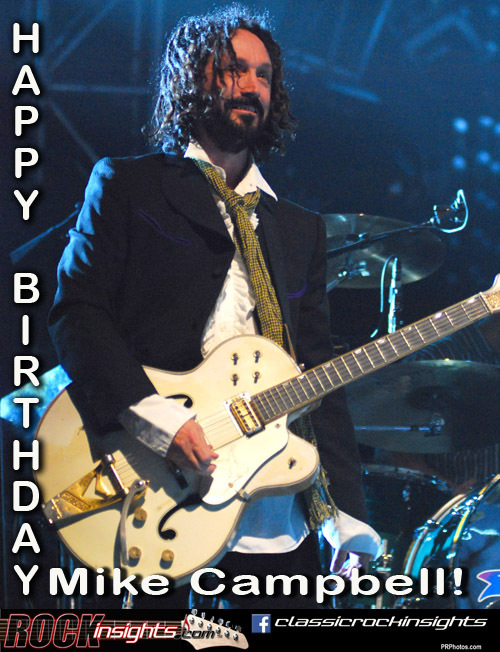 Heartbreakers and now Fleetwood Mac member Mike Campbell was born on this day in 1950 in Panama City, Florida. A scorching version of Chuck Berry's Johnny B. Goode earned Mike an added guitarist spot in Mudcrutch, the Gainsville based group Tom Petty formed in the early 1970's. That group fell apart after moving to LA and getting a record deal in 1974 that only produced one single that got little traction. Campbell and Benmont Tench from Mudcrutch reunited with Tom in 1976 to form Tom Petty and the Heartbreakers. The debut album released in November of that year on the same label that gave up on Mudcrutch got off to a slow start in the states, but interest and sales started to kick in after Petty and the band toured the UK and sales there took off. Tom gave a good deal of credit for the group's eventual success to Jon Scott, a promotion man that worked the debut album record relentlessly. Jon's book, Tom Petty and Me is a great read about his four decade friendship and association with Tom and the Heartbreakers. Five months after Petty's tragic passing Campbell was invited to join Fleetwood Mac, replacing Lindsey Buckingham.